Passiflora incarnata looking like it's designed to communicate with extraterrestrials. Passionflower is an example of how we can lose an appreciation for the familiar. The exotically beautiful, though completely native, passionflower vine (Passiflora incarnata) is one of the few Passiflora species which grows in our temperate climate, and for this we can be thankful. This backyard remedy is tremendously useful for stress-related conditions: sleeplessness, tension, muscle spasms, irritability, restlessness, teeth-grinding, headaches, high blood pressure, attention-deficit, and even for withdrawal symptoms from addictive substances. Passionflower is a deciduous vine with three-lobed leaves that smell like peanut butter when crushed. Its highly complex flowers bloom from June-October, and look as if they’re designed to communicate with outer-space extraterrestrials – though the passionflower is actually named by imaginative 16th century Spaniards for its symbolic imagery of Christ’s passion. Passionflower fruits of Passiflora incarnata. Edible, sweet-tasting fruits form after the flowers are finished, and ripen from green to yellowish-orange two months after forming. The vine often crawls along the ground, and when you step on the fruits they may pop, giving passionflower its other popular name, ‘maypop’. 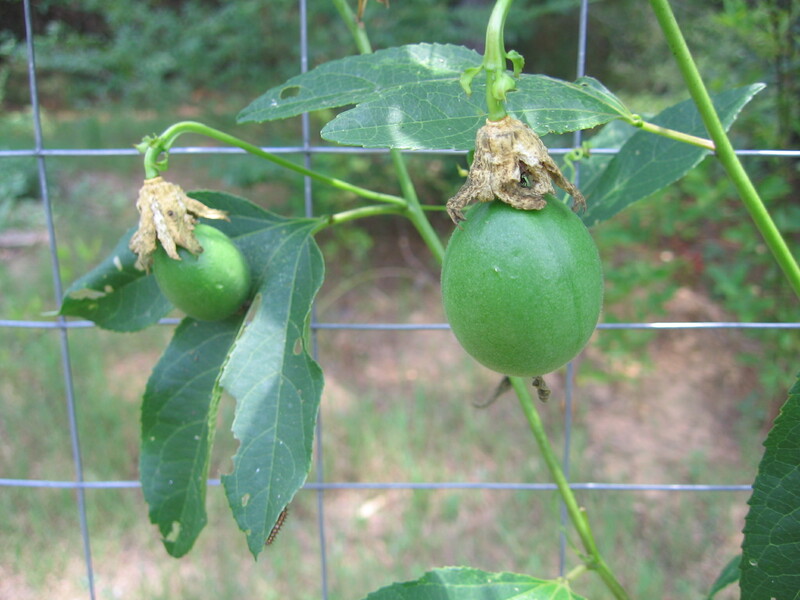 Although the passionflower vine will grow in clay, it is most happy sprawled out over your vegetables, taking advantage of loose, fertile soil. To introduce passionflower into your garden, prepare a sunny spot as you would for tomatoes, and plant the seeds from a dried passionflower fruit. Give it space and a trellis or fence to climb. Venturing young shoots and leaves can be eaten when boiled and then sautéed. Medicinally, passionflower is traditionally indicated when someone cannot sleep due to repetitive, worry-filled thoughts circling all night. Passionflower stills the rambling, anxious thoughts, bringing a calm and relaxed sleep without any sleep-medication “hangover”. 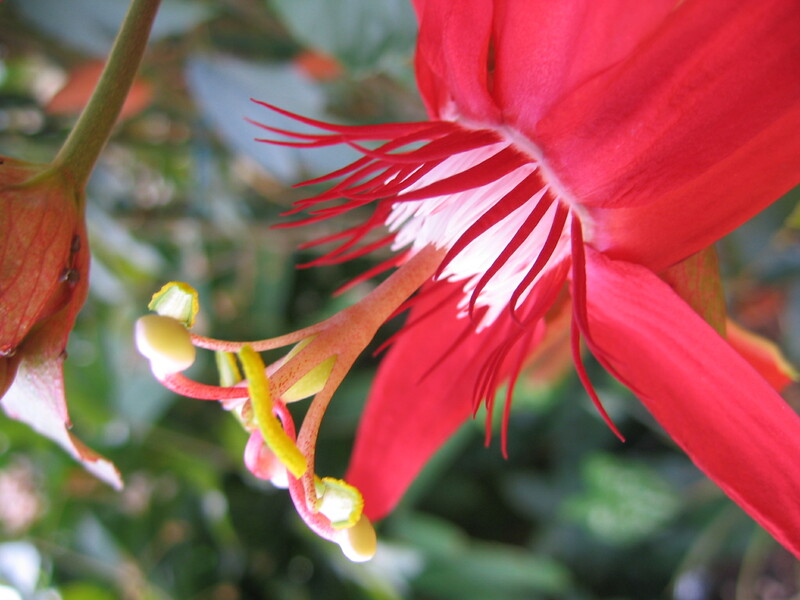 Numerous pharmacological investigations have confirmed passionflower’s ability to relieve anxiety. In one clinical trial of 36 people with generalized anxiety disorder diagnosed by DSM-IV standards who were randomly given either passionflower or oxazepam, a benzodiazepine prescribed for anxiety and alcohol withdrawal symptoms, the results found that passionflower and the pharmaceutical relieved anxiety equally; however, passionflower affected the participants’ job performance far less than oxazepam. An additional difference is that passionflower is safe in moderate amounts and non-addictive. Studies also report its efficacy in reducing drug withdrawal symptoms for nicotine, alcohol, and opiates, such as morphine by increasing the effects of GABA, a neurotransmitter which calms the body’s response to stimuli. Surprisingly the flowers hold little medicinal value, besides looking at them. The majority of the nerve-calming qualities come from a tea or extract made from the leaves and stems, either fresh or dried. Commercial sources of the live plant are few. It’s more common to find the South American blue passionflower (Passiflora caerulea), which has five-lobed leaves, an edible fruit and is almost evergreen in Athens. Old-timer herbalist Tommie Bass said that passionflower brings people together by helping them to relax. He suggested it for domestic partners who’ve grown annoyed with the little things over the years, losing appreciation for the familiar. 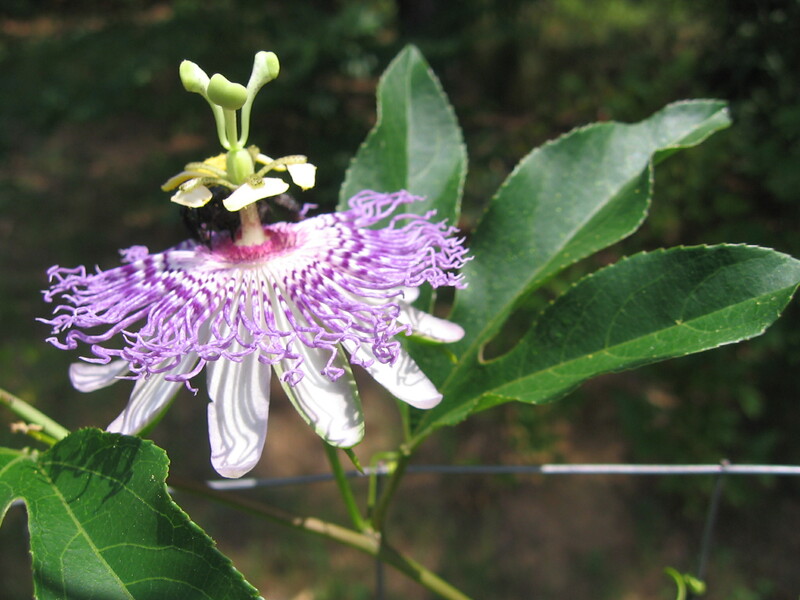 Cherokee Indians similarly used passionflower as a social beverage. If fences make good neighbors, then maybe passionflower should grow along the fence. This article appeared in the Athens Banner-Herald on July 4, 2010. Passionflower botanical (1902) Dodd, Mead & Company. 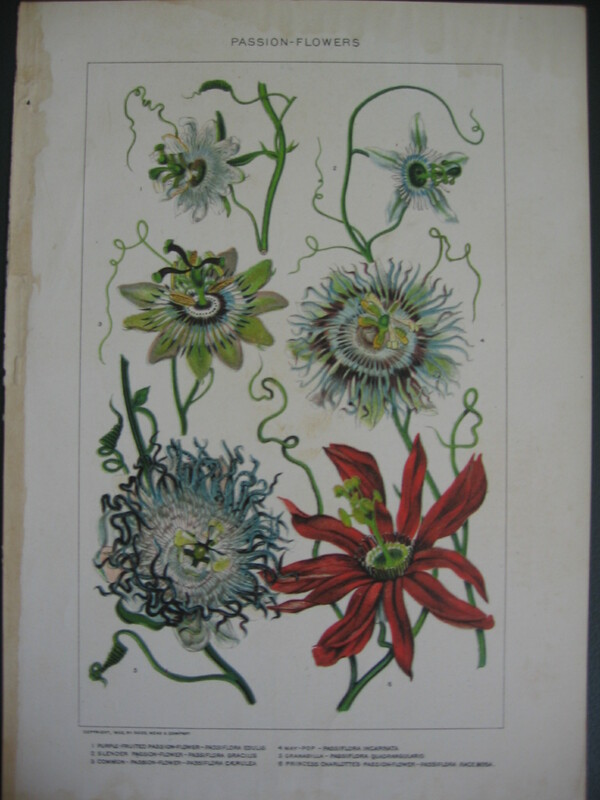 This botanical print came from a book. I have it in a simple frame.